This guide explains how to enter details of loans provided to employees and shows how the benefit of such loans are calculated. You should refer to the HMRC publication 480: Expenses and Benefits – a Tax Guide for a more detailed explanation. Note that Payroll Manager uses the ‘Normal Averaging Method’ when calculating the cash equivalent of beneficial loans, and is able to handle a maximum of 2 loans per employee. If you wish to use a different method of calculation, or if an employee has more than 2 loans then you will not be able to use Payroll Manager to produce the P11d. Number of joint borrowers – Leave this field blank, unless the loan is being made jointly to 2 or more directors/employees, in which case enter the number of borrowers. Amount outstanding at start of year OR loan – If the loan was carried forward from a previous tax year then enter the amount that was carried forward. If the loan was made during the tax year then enter the opening balance of the loan. Do NOT leave this field blank. Amount outstanding at end of year OR loan – If the loan was not discharged during the year then enter the outstanding balance at the end of the tax year. If the loan was discharged during the year then enter the balance of the loan immediately before it was discharged. Do NOT leave this field blank. Maximum amount outstanding during the year – Enter the maximum balance of the loan at any point during the tax year. Do NOT leave this field blank. Interest paid during the year – If the employee has already paid any interest on the loan then enter the amount here, otherwise leave this field blank. Date loan made if this year – If the loan was made during the tax year then enter the date here – otherwise leave this field blank (and Payroll Manager will assume that the loan was already in place at the start of the tax year). Date loan discharged if this year – If the loan was discharged during the tax year then enter the date here – otherwise leave this field blank (and Payroll Manager will assume that the loan continued beyond the end of the tax year). Written off – If the loan has been written off then tick this box, otherwise leave it unticked. Amount forgone – If you are using Optional Remuneration Arrangements ‘OpRA’ to provide a loan then please enter the relevant figure here, otherwise leave this field blank. For more information on OpRA please see section 6 of this guide. – Click ‘OK’ when you have finished entering details of the loan. The rules for calculating the loan benefit as specified by HMRC are as follows: (Payroll Manager performs these calculations automatically according to the data entered above). A: Determine the balance at start of the tax year or start of the loan, whichever is later. B: Determine the balance at end of the tax year or when the loan was discharged, whichever is earlier. C: Add these two figures together (A+B). G: Find the appropriate Official rate of interest – see HMRC Official Rates for details. H: Multiply by official rate of interest (F*G). K: Take off any interest already paid to give the cash equivalent benefit of the loan (H-J). A: The loan was made after the start of the tax year and the initial balance was £20,000. B: The employee paid back the balance of the loan before the end of the tax year, the amount paid to discharge the loan was £15,000. C: The sum of the figures was £35,000 (A+B). D: The average amount of the loan was £17,500 (C/2). E: The number of complete tax months for which the loan was outstanding in that tax year was 3 (i.e. the tax months of May, June and July. April was not counted as the loan was made following the start of that month and August was not counted as the loan was discharged before the end of that month). F: Average multiplied by months/12 = £4,375 (D*E/12). G: In this example, the Official Rate of Interest for the year was 2.50%. See HMRC Official Rates for details. H: Interest at the official rate was £4,375 * 2.50% = £109.00 (rounded) (F*G). J: Interest already paid was £0.00. K: The cash equivalent of the loan was therefore £109.00 (H-J). Balance at start of year or loan: – This field must not be left blank. It is the balance of the loan either at the start of the tax year or the initial balance if the loan was made during the tax year. Balance at end of year of loan: – This field must not be left blank. If the loan was paid off during the tax year then you should enter the final amount that was paid by the employee in order to discharge the loan. Is the loan a ‘small’ loan? If the maximum balance of the loan at any point during the year is below a certain threshold (currently £10,000) then it is termed a ‘small loan’ and as such is exempt from the benefit calculation. Loans below this threshold will result in a cash equivalent calculation of zero. See the HMRC publication 480: Expenses and Benefits – a Tax Guide for a more detailed explanation. Only complete tax months are included when determining the number of months during which the loan was owing. e.g if the loan was made on 10th April and paid off on 1st September then it was outstanding for only 3 complete tax months (6 May-5 June, 6 June-5 July, 6 July-5 August). The months of April, August and September are not complete and so are not included. Loan benefits are reported to HMRC via the P11d following the end of the tax year. 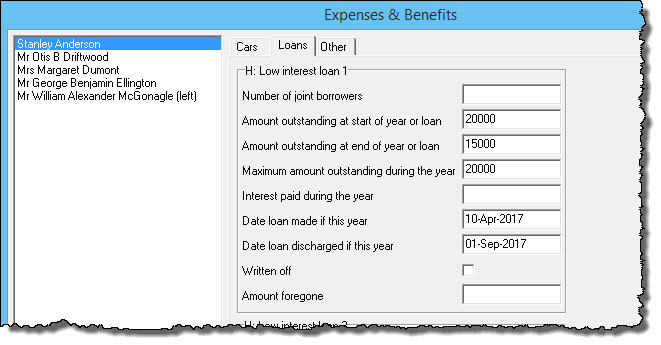 To see details of the P11d click ‘Forms’ then ‘Expenses & Benefits P11d’ from the main menu in Payroll Manager. Loans provided to employees as a benefit also generate a liability of employers class 1A National Insurance which must be paid to HMRC by 22 July following the relevant tax year. See HMRC guide Pay employers’ Class 1A National Insurance’ for more details. You should also file return P11D(b) to HMRC which is a summary of these liabilities. Click ‘Forms’ then ‘Employer’s Declaration P11D(b)’ to view and file this return. Some employers use Optional Remuneration Arrangements (OpRA) such as ‘Salary Sacrifice’ to provide benefits to their employees. From April 2017 new rules were introduced so that the taxable value of a Benefit in Kind (BIK) is now the higher of the taxable value of that BIK under the ‘normal’ rules and the amount of salary/cash forgone. If you are using OpRA to provide employee loans then please read Appendix 12 HMRC 480: Expenses and Benefits Guide before completing your P11ds. In these cirumstances you should enter the ‘amount forgone’ in the relevant box as shown in section 1 of this guide.